In-depth investigation and analysis of the stories behind the day's headlines. 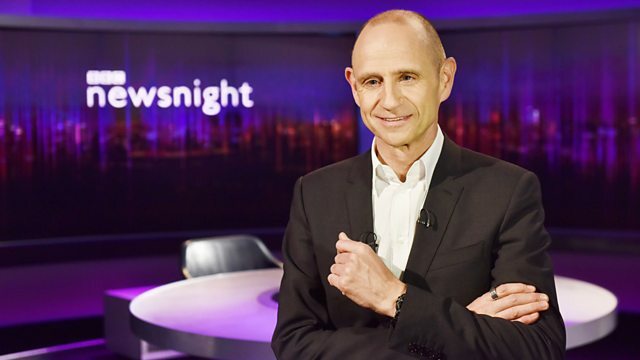 On tonight's programme Evan Davis asks who is winning the diplomatic war between Britain and Russia. What game is Putin playing? is getting exactly what he wants. We will ask if he's right. dealt with events this week? being investigated as a murder. of the Chemical Weapons Convention. saying it is now a murder inquiry. killing of an opponent in London. was him to be their? as to what has happened. is trying to look not goaded. plan? What is he trying to achieve? what we ought to be doing. mobilise and it requires consensus. what was the way out? could be that standards are falling. often close to President Putin. been nice to, by the way. and given him a PhD. Deripaska sailed to Corfu for one. So, too, was George Osborne. It caused a bit of a do. this didn't look very good. who owns this villa on the island. But there was a leak. a donation, something they denied. There are nearly 100 of them. more wary than the Brits. But I believe whatever it is. are involved in this work. in Russia at the moment. 19 years old at the time. flotation of Deripaska business En+. of the British ruling elite. of the posh folk of London. is happy, should we care? on all Russians in London. with and takes money from. or two of those themes shortly. about the Russians this week. In a way, this isn't surprising. we are in dealing with these things. at times of external threat. with quite a few don't knows. it's two to one the other way. and 18% say he has done well. of "don't knows" in his case. and the Times's Jenni Russell. country are not buying it. many people who say they don't know. where are you on these? does it do Labor Day. could be testing our isolation. the people running the Labour Party. show it at its worst? banter from the Defence Secretary. that sense we are on the back foot. according to the Evening Standard. was the UK's first urban cable car. But it didn't attract the masses. # Do you miss me tonight? # Are you sorry we drifted apart? In-depth investigation and analysis of the stories behind the day's headlines with Evan Davis. Evan asks who is winning the diplomatic war between Britain and Russia.